Time is precious but planning is divine. No one can change the time. Oh yeah, that’s right! Maybe you can on your wall clocks or your wristwatches but not in real life. Every minute you lose is gone and never coming back. Once a minute is gone, you’re already left with just 23hours and 59minutes. I know what you’re thinking. Yeah, that’s only a minute gone but it is about time you remind yourself that a few more minutes will give you an hour and eventually, that day is almost getting over. Successful people are time conscious and if you want to achieve the goals that you’ve set daily, you’ve got to do same and that means beginning your day like a pro. Planning a perfect day is okay but what’s not is when that plan actually starts. Again, people who are successful plan ahead of time. 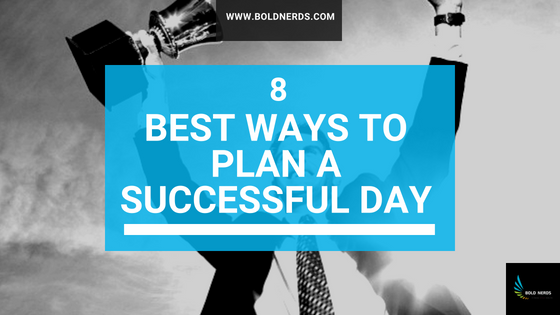 If you want tomorrow to be the perfect day, start planning and organizing today. Before you set out to achieve something, you are aware of the possible result(s) and maybe a bit of what you have to do to accomplish that. In planning a successful day, you’d have to prepare beforehand although tomorrow isn’t for you to decide. Get things in order, list your tasks down and plan your schedules ahead of tomorrow. This will not only help you have a successful day but will make you feel relaxed since you already know what you have to do and when you have to get it done. There’s no way you’re going to get something done if you have no idea what it is you have to do. It is important you remind yourself of the tasks. Yes, you could have them in mind but its most effective if you write them down. It acts as a reminder. Anytime you forget something, you can quickly refer to your to-do list and stick to the plan. Now you know what you have to get done. It is time to envisage the end results. How would you want the results to be? Just good, better or best? You decide! Completing all the tasks you listed is a better result but doing them properly or adding subsequent tasks makes it best. Picturing the result while you’re yet to start work keeps you motivated and helps you stick with it since you know what you’re getting after you complete the task at hand. You aren’t going to run late for something you began earlier. Unless you want to or stopped along the way. Wake up early and put some actions in place to execute your plan. Eschew checking social media first thing when you’re up, it saves time and you know I’m right. Instead, get a quick morning workout and hit the shower afterward. Then you can have a healthy breakfast before striking with the reason you’re up. Start small, do the little task first and build confidence for the next tasks. Yeah, don’t worry, that’s something great. Sometimes, the little things mean a lot more than the huge ones. If you’re able to complete this minor task, it charges you to look further for the next major task. In everything you do, set time aside for yourself. Pulse, refill, eat something healthy or have a quick healthy but delicious smoothie. Take a deep breath to help you relax before going back to work. You planned for today and it was successful, why not make tomorrow even better. Quickly review today’s task, examine the shortfalls and improve on them the next day. After every hard work, you need to rest. God the Almighty and All-knowing rested on the seventh day after creating the universe and all that is in it. So why shouldn’t you? He made the night for a reason. Whether you have been successful or not, you might definitely be exhausted and need to recharge. Have enough rest and avoid stress. 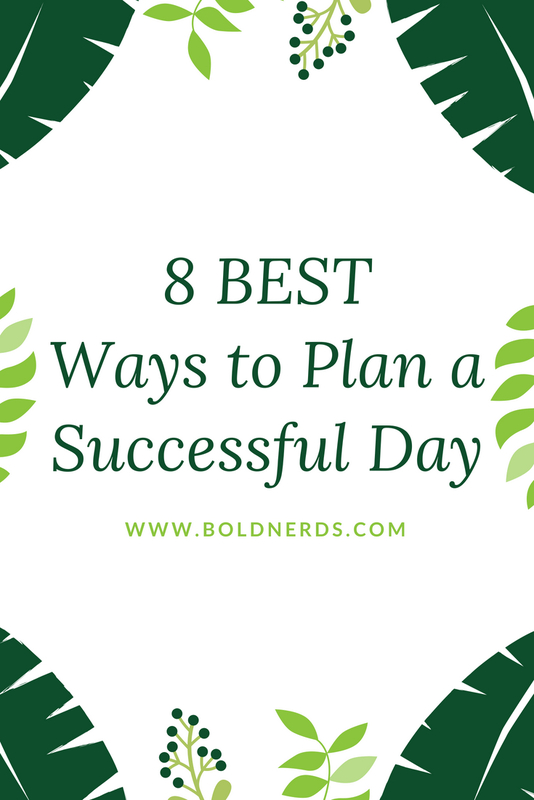 If you follow these simple tips, you should be able to walk yourself through each day feeling successful and having completed all task on your to-do list. For starters, this might sound like something you don’t wish to try and seem difficult to stick to but I can assure you that you only need a week to get used to this to make it a part of your life. It so much easier if it becomes a habit. You do it without noticing and you’d always be productive. So, what do you have to say about this list? Have you done any yet and what’s your take? What tips have you tried and recommend which hasn’t been included here? Would you like to share anything with us? Let us know them in the comment box. This blog post was inspired by a cherished reader, Imogen Gray. Like it? Pin & Share it! Subscribe below for more self-development tips.